Brendan Rogers, in action for Queen's against Antrim's Sean Burke, will come back into contention for Derry in this weekend's McKenna Cup semi-final aginst Cavan. Slaughtneil’s Brendan Rogers will come into contention for this Sunday’s Bank of Ireland Dr McKenna Cup semi-final against Cavan, four days after trying to knock his native county out! Rogers was part of the Queen’s University side that lost out by 0-17 to 2-08 at Celtic Park on Wednesday night after an encouraging display that pushed Derry to the final whistle. I’ve heard good reports about Cavan. I was chatting to Cailean O’Boyle who played against them with Jordanstown and he was highly impressed with them. Alongside other university players like Cailean O’Boyle, Rogers is now available for the Oak Leaf county and assistant manager Brian McGuckin confirmed he will come into contention. “Our aim at the start of the McKenna Cup was to qualify for the semi-final stages,” explained McGuckin, “We’re carrying a big squad at the minute – over 45 players. It’s an opportunity to get everybody game time. Cavan qualified top of Group C after defeating Armagh and UUJ and drawing with Monaghan and McGuckin is expecting a tough test this weekend. 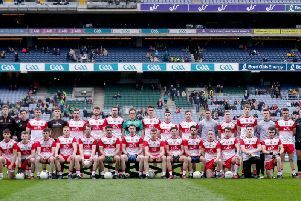 After making 12 changes for Wednesday night final Group game, Derry will be expected to reshuffle things again against a defensively strong Cavan side but McGuckin is hoping the Oak Leafers can continue a scoring run that saw them average 21 points per game in the group - the highest of any side in the competition. “Although we scored four goals at the weekend, we only scored six points and you know we made that very clear to the players before we went out that was something we wanted to rectify - so we’re pleased with the 17 scores.